360 Video & Motion VR brings a new perspective to architectural visualization. The advent of 360˚ video and virtual reality allows our clients to investigate, understand and design with a greater level of accuracy. It has enabled the design teams to work more collaboratively and in real-time. Our VR team builds the 3D environment and then moves a camera through the space. However, the camera has a 360˚ lense that allows the viewer to rotate the view angle in real-time. VR photography, or virtual reality photography, is the interactive viewing of wide-angle panoramic photographs or renderings, generally encompassing a 360-degree circle or a spherical view. 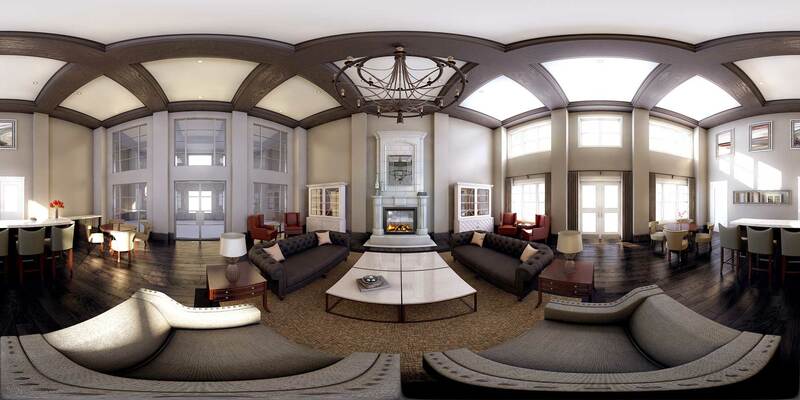 create memorable virtual spaces for our clients. 360-degree videos, also known as immersive videos or spherical videos, are video recordings ( or animations ) where a view in every direction is recorded at the same time, shot using an omnidirectional camera or a collection of cameras. During playback the viewer has control of the viewing direction like a panorama.